Get Ready To Go Nuts!!! At The 10th Annual White Squirrel May 24th through the 26th, 2013 in downtown Brevard, North Carolina. And this year's music and street fest promises to be bigger, better and nuttier than ever! 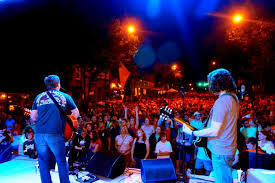 Voted “Best Spring Music Festival in Western North Carolina” by Asheville Citizen Times News Poll 2008. And "Top 10 Coolest Small Towns in America by Budget Travel." We will kick off the 10th Annual White Squirrel Festival with our 6th Annual Memorial Day Parade, which is organized by the American Legion and VFW. This crowd-pleasing event will take place on Saturday at 9:00am, followed by a “Presentation of the Wreath” ceremony at our county War Memorial. Encounter a fun packed weekend of free concerts on Main Street, downtown Brevard, with headliners like Jupiter Coyote, Acoustic Syndicate and Shannon Whitworth! !...14 live concerts in all. Enjoy over eight blocks of street vendors, food vendors, merchants, artists, craftsmen, potters, painters, games, kid's activities and loads of plain old fashioned fun! And don’t forget our Squirrel Box Derby where children and adults alike come from all over the region for a chance to race handmade derby carts down the infamous Jailhouse Hill. From fastest to squirreliest, there are prize categories for everyone! 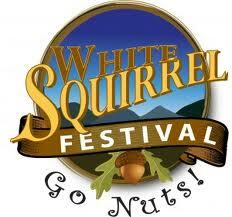 And speaking of races, be sure to check out the 5K and 10K White Squirrel races sponsored by the Rotary Club. Enjoy the most fun filled weekend in beautiful downtown Brevard of Western North Carolina! From festivals to waterfalls to hiking and biking, there's something for everyone. Bring your family and experience the best Memorial Day Weekend ever in downtown Brevard, North Carolina. Brevard and less than 30 miles from Asheville, 20 miles from Hendersonville, and less than 3 hours from major metropolitan areas of Charlotte, NC; Knoxville, TN; Atlanta, GA. Also we are located just a stone’s throw from many of the area’s best attractions such as the Biltmore Estate, Chimney Rock and Grandfather Mountain and very convenient connection to the Blue Ridge Parkway.